I’m still going through my Asia trip photos from May. At least now, I’ve made it to the Japan pictures. On my first night in Japan, after finding our hotel, which just so happened to be less than a two-minute walk from Shin-okubo station, I was famished. It was late enough that I didn’t want to take the JR anywhere, so I wandered around the busy street looking for something to eat. Luckily, just across the street was a ubiquitous ramen-shop and I finally experienced first hand just how in the future Japan was. Right by the door is a vending machine, but instead of snacks or drinks in a display case, there were pictures of different types of ramen. Not knowing how to read Japanese, I just went off the picture. Most of the bowls were in the $7-10 price range, which is about what I’d pay in LA for ramen. 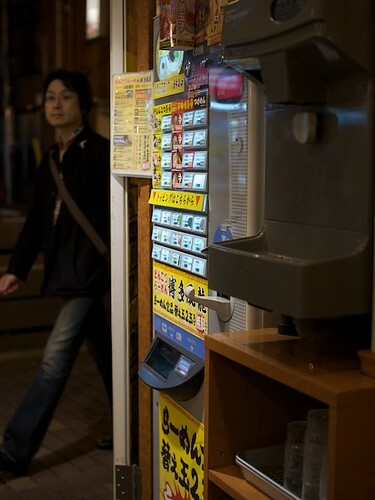 After putting my coins in and pressing a button, a ticket was released from the machine, which I was instructed to give to the chef behind the counter. Because it was so late at night, I was only part of the handful of people sitting around the ramen counter. It felt silly to hand my meal ticket over to the cook instead of just telling him what I wanted, but I assume this makes it easier when the restaurant’s really busy. In no time, a bowl of ramen was set in front of me in all its glory. 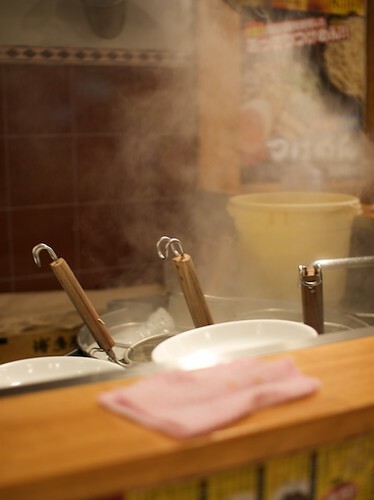 My first meal in Japan and it was one of my favorite ways of starch delivery: noodle soup. The broth was rich and porky, the noodles were chewy but not underdone, and the various vegetables and wood-ear mushroom were seasoned perfectly. 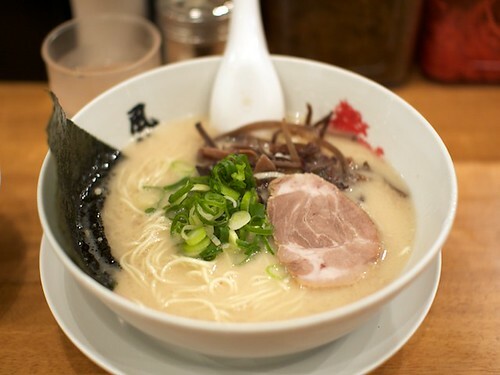 One spoonful from the bowl made me wonder, maybe what they say about Japan and ramen was true: you can wander into any random ramen-ya and get a great bowl of ramen. Even though I was starving, the bowl was massive and I was stuffed by the time I made it halfway through the noodles. To my astonishment, another customer, a slender, young Japanese man asked for a second bowl of noodles to dump into his bowl! I bow down to you, ramen noodle eating master. 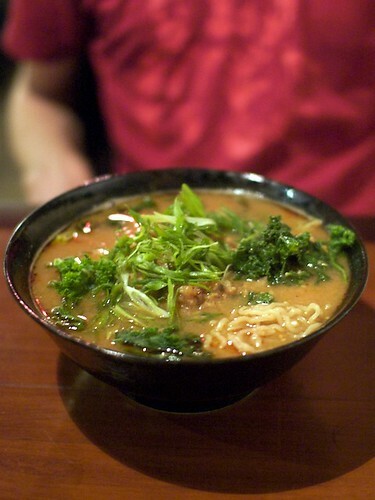 A few months ago, Shojin, a vegan restaurant in Little Tokyo introduced vegan ramen on their menu. Our first attempt at trying this rare bowl of soup was foiled when we unknowingly arrived during their sushi night. Apparently, no ramen was to be had on sushi night. A week later, we made sure it wasn’t sushi night and tried again. I tempered my expectations a little, telling myself that there’s just no way a non-meat version of ramen could compare to the broth at Daikokuya, a stone’s throw away, so I shouldn’t even think about the comparison. I would think about vegan ramen as a completely different species as regular ramen. I ordered the sesame ramen, which from the description on their menu, made me think it was Shojin’s attempt at a milky, rich broth. Unfortunately, the richness came from soymilk and tahini. The broth just didn’t have the same mouthfeel as a slow-simmered pork broth, but that wasn’t the soup’s only short-coming. That would be reserved for the overwhelming flavor of tahini. I had expected a slight nutty taste like that of sesame oil, but the broth tasted just like watered down tahini with a bit of bitterness. Will ordered a more traditional ramen, which I believe was the spicy miso ramen. It was a Japanese level of spicy (not spicy at all) but the broth was a great deal better than mine. 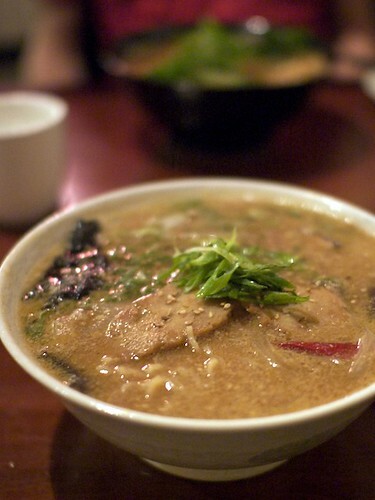 The miso lent the broth the much-needed umami flavor. The broth wasn’t too shabby for a vegan ramen broth. 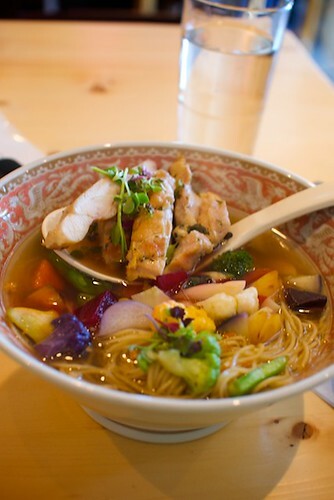 Although Shojin didn’t make the ramen noodles from scratch, I was glad that they cooked them well. The noodles were chewy, plentiful, and managed not to get too soggy. The vegetables (mainly kale) were a great addition too. What was blatantly missing from our bowl though, were the pickled slices of bamboo which often comes with ramen. I don’t think there was anything un-vegan about pickled bamboo. I was sorry to see it missing. Our bowls also came with a few slices of seitan ‘cha-siu’ which I could have done without. The texture was good, but the slices weren’t seasoned well at all. Shojin’s ramen isn’t going to be luring any omnivores through its doors, but considering they’re the only place I know of that serves actual vegan ramen, it’s worth going for the vegetable-inclined.